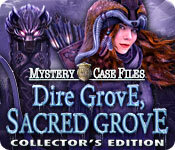 Mystery Case Files: Dire Grove, Sacred Grove Collector's Edition is rated 3.6 out of 5 by 263. Rated 5 out of 5 by lmaddison from Best games I've played in a long time I really can't say enough positive about this game. I know it's been out for a while, but I just got around to it, and it was well worth the price. The graphics are, of course, beautifully rendered. The animation of characters speaking is also non-jarring as in some games, the movement looks awkward. The characters themselves are realistic and their costumes creative and fitting to their roles. 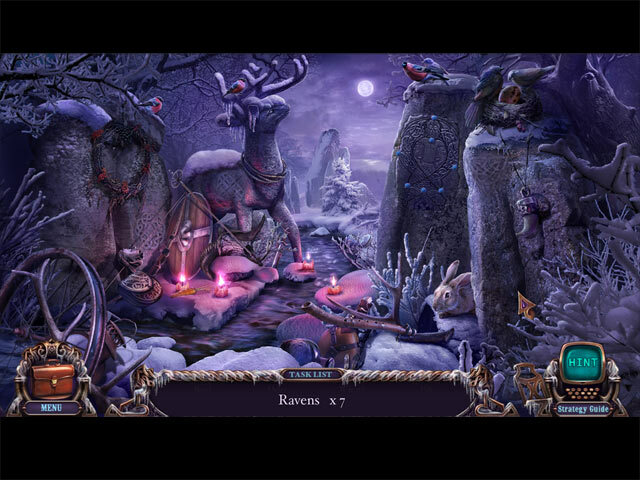 The plot is well conceived and detailed, particularly in the context of a computer game. The story line takes some twists and turns, with a few false leads thrown in for good measure. I found that I actually wanted to know who was behind the conflict. The dialogue is pretty well written, with very few grammatical or spelling errors which I personally find distracting. The voice overs are very well done with appropriate accents for the characters. I have sampled some of the company's latest games, e.g., Revenant, but was not engaged by the plot anywhere near as much as in Dire Grove, Sacred Grove. In the collector's edition, there are extras such as finding jigsaw puzzle parts and then assembling each of several puzzles. Of course, the CE also includes a bonus chapter, which adds a whole new dimension to the plot. The various activities make sense in terms of carrying out the Master Detective's goals. I really enjoyed that the game was divided into segments of investigation, and as each was completed, a new question arose based on the previous conclusion. The game was also lengthy, allowing for a lot of enjoyment. Even the bonus chapter, which from some creators is pretty brief, was a story all in itself. I kept expecting it to conclude, but was pleased to see that I was being led to yet another investigative chapter. The puzzles within the game are intricate and a bit challenging, at least for me, thus I resorted to the strategy guide more than once. But they are very well thought out. I don't want to give away the plot, but this game (the Collector's Edition specifically) ties into Dire Grove's history in a pleasingly unexpected way. Rated 5 out of 5 by Majestyx12 from Love the Puzzles This has puzzles more similar to Return to Ravenhearst than Key to Ravenhearst. I had a great time with this game. The bonus game was lengthy and I didn't want it to end. Loved it. Rated 5 out of 5 by DutchDoll60 from Dire Grove revisited much better than first I really enjoyed playing this Dire Grove visit. I quit the first. I enjoyed the interaction with the characters and the twists and turns of the plot. Will probably play again. Rated 5 out of 5 by kerith90angel from Based on Full SE, bonus, & alt end game play. Here is what you can't see..... ****may contain spoilers***** To see other reviews: click on the person's Big Fish ID/name in blue.... THIS GAME HAD THE BEST COLLECTABLE I HAVE EVER PLAYED..... IT HAD A PURPOSE, AND I REALLY FELT REWARDED! With the release of the new MCF #12 Key to R., I'd realized I am a couple MCF behind...so I just finished both CE I own of MCF Escape from Ravenh, & this one Dire G Sacred G. waiting for the new one to come out in SE. First of all... this is BY FAR the LONGEST game I have ever played. The SE took me-5 hrs, Bonus Play took-2 hrs 42 min, and Altern ending took- 1 hr 15min for the complete play gametime = 9- NINE hours! the bonus alone is around 4 hours between both bonus options. /which is 1 hr short of the main game! So for this ALONE... if you enjoyed the SE and are deciding to go back for a replay,,,,, this one is WELL WORTH YOUR PENNY!! I will talk more about the bonus play in a minute. But for now, these are the other things this CE has to offer. I actually cringed when I saw the first cut scene with hunters holding guns. I've put this game off for a long time because I am a huge animal lover and not a fan of guns or traps in games. I am SO GLAD I played this game though, because the story isn't quite what it appeared to be. No animals are hurt, but one "spirit bear" is shot in the 1st Bonus play... -- yet he lives instead-- in the Alternate ending, way better. After I played the demo a bit, I realized the PUZZLE PIECES YOU COLLECT ARE FOR 4 JIGSAW PUZZLES YOU PUT TOGETHER IN THE SE. As you complete each puzzle you can SET A SCREENSAVER TO YOUR DESKTOP! Seriously.... I felt like I had collected and collected items from all these games for this very moment!! They had a purpose folks!! IT WAS SOOOOOO SMART AND SOOOO FUN to keep putting together the jigsaw picture so I could set the next screensaver. This is BY FAR the best collectable I've had in a game. The other Collectable being - I think there were 9 houses that morphed in some scenes and at the end there is a page for them where you can turn on/off the lights in the model houses, or a string of xmas lights, or car lights etc. very cute. 1. 5 SCREENSAVERS: - That double as collectable puzzle pieces. I ADORED this little hunt and was THRILLED when I thought they ended at 4 SS at the end of the SE, only to find there was a whole NEW puzzle in the Bonus Play! Sadly, though, I MISSED a piece and could not go back to get it when credits rolled after Bonus play #1 ended. SO. BE SURE TO LOOK FOR ALL THOSE PIECES BEFORE CREDITS using the WTG before the game end!! So I guess if I want the last Screensaver I will have to play the first bonus play again --which took me almost 3 hours to begin with! These also save to your computer's doc file 2. A 78 pg. /6 chapter/ and a bonus chapter Walkthrough Guide. Chapters 1-6/are 49 pgs & make up the Standard Edition. The 1st bonus chapter is from pgs.49-63/ where the puzzle pieces are from pgs 64-66/ Models you collect pg 67 and the 2nd bonus play or Alternate ending pgs 68-78. 3. 15 WALLPAPERS that save to ur doc file- but 2 remain locked until bonus completed- geez DEV... PLEASE LET US HAVE ALL GOODIES UP FRONT!! 4. 12 CONCEPT ART- saveable with Elephant Logo. 5. 5 MUSIC TRACKS- that save. I only noticed 2.... the typical MCF theme, and a song they used in the HOS that was driving me crazy.... I could not stand that HO song! for all Ho games it seemed to be the same song! 6. 10 Video cut scenes- but 2 are still locked after SE, need to complete bonus to get see them all again. 7. MORE ON THE BONUS PLAY- First of all, I don't feel the Standard edition ended making much sense. I feel like the "Alternate ending" your given may have been a Chapter 7 at one point for the SE and removed. The Alternate ending makes the entire convoluted story make sense. I just felt the SE storyline was a little discombobulated without that ending. SO. ~IF YOU CAN~ PLAY ALT.ENDING- on the upper R in bonus BEFORE you play the BONUS PLAY. Because the bonus play story doesn't even make sense UNTIL you play the ALT ENDING- which I wish I'd played first to tie up the loose ends of the Standard edition. CHAPTER 6 in the SE is absolutely gorgeous and most if not all the Alternated ending is replayed in this area. Most of the MG and HOs are ALSO SE repeats. You only have Bjorns squirrel once in the Alt ending where-as he is an adorable little helper ALL through the Bonus Play. You realize, or remember that is... your nemesis Alister from MCF Fates Carnival is in this game too...but I had forgotten him until his connection was mentioned in the Alternate ending. 8. BONUS PLAY- again, if possible play it AFTER the alternate ending. One is one the top of the Left column in Bonus and the Alt ending addl. play is on the Right column. THIS IS ONE OF THE MOST BEAUTIFUL BONUS' I'VE EVER PLAYED, and trust me, I have played A LOT! If you play Alternate Bonus Ending first, it is a complete ending to the Standard Edition. Then go on to the Bonus Play and you start out, it is 4 hours later, you are in your, literally, frozen car and find out there is another evil doer in town! He is called the Hermit, and you must find him so he stops controlling the minds of some of the previous characters we've met in the standard edition. There are 14 new or revised to look new areas of play, I counted 10 new mini-games and only 3 new HOS. I wish that had been reversed. I WOULD BET, IF BIG FISH POLLED ITS CUSTOMERS, MOST OF US WOULD RATHER HAVE MORE HOS IN A HO GAME THEN THE MINIGAMES. I'm not quite sure why the genre of HO game ends up now a days being a MG- Adventure. But I digress. I just can't tell you how gorgeous this game gets from Chapter 6 right on through for another approx.3 hours of bonus. It continues snowing but you are mostly in the area of the mist walkers turf which was just great. I would have been really bummed if the Alt. Ending had been the only bonus play due to the repetition.... but you get every pennies worth in this CE.... because this Chapter /and it IS a Chapter or more/ is REALLY NEEDED to make this entire game, including the standard edition, to make sense. 9. Acheiv. Page... I personally feel Acheiv. are a waste of time in CE. Could care less. But for those of you who do.... I really don't know if completing these unlocks more or not.... I never completed. But-- one neat thing that is different-- Geez, you really do have to LOVE ELEPHANT FOR CE DETAIL.... There is a gorgeous little area Achievements are collected-- like in a Stonehenge picture. When you click on each Achievm. it has a little reward icon such as, one was a bronze owl, and it come up close for inspection when you click it. DEAR ELEPHANT GAMES, Holy Toledo I amsuch a fan of yours!! You did justice to the MCF, such a baby of Big Fish and you should be so proud! I wanted to take the time and thank you for 9 full hours of my life collecting those little jigsaw pieces and one by one going back to create my 5, count them, 5 screensavers!! I know this is stupid, but I feel like I won the lotto when I saw the first jigsaw turn into a SETTING for my desktop. YOU ALL GIVE SO much attention, detail, and LOVE to your games. I had such a blast in this GORGEOUS world of a game you created. Each and every one of you gets hugs from this Big Fish fan! Hats off to the Voice actors here, all A+. Tim Simmons, the voice of The Hermit, and Bjorn was SO WELL DONE! !// yes, I do read the credits.... btw... I recently saw one DEV add picts of the game Creators in the credits with what area of game they worked on and it WILL make people watch those credits. FINALLY.... PLEASE ELEPHANT.... BRING US MORE LIKE THIS FOR COLLECTIONS, the jigsaw, to Screensavers!/ Geez, if you did, I WOULD HAVE TO BUY EVERY collectors Ed made like this!! Morphs in each scene are also fun instead of the larger statues. Thanks again Elephant!! And... Thank you Big Fish Games! Rated 5 out of 5 by tunaontoast from Loved this game! I really enjoyed playing Dire Grove Sacred Grove CE. The story was engaging and kept my attention throughout the entire game. The artwork is beautiful and the music is haunting. Even though the story is very different from the original game it's still is a fabulous story. I appreciated how they kept to the original scenery, I felt like I was there before. Thank you to the devs for using the original MCF theme music which is very important to me. Rated 5 out of 5 by tutortime from Excellent game ! Loved this game. This developer never disappoints. This CC was worth the money as it had some new scenes to interact in. A nice long game. Rated 5 out of 5 by SeaSirenFL from Excellent Fun, Great Game! I loved this game! Enjoyed every minute of it. 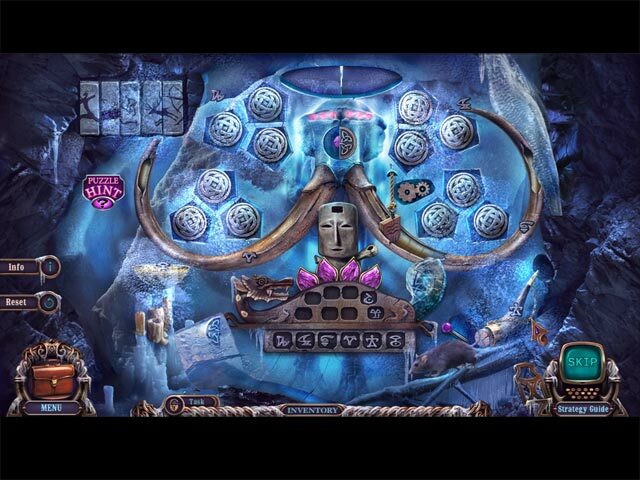 It's filled with super puzzles that are challenging and enjoyable. The art work and color are superb and the characters are interesting. It doesn't deserve the negative ratings that compare it to the prior Dire Grove. This game stands on it's own and deserves high ratings. Rated 5 out of 5 by An0therW0rld from Doesn't Deserve Negative Reviews I was unsure about buying this game due to the mixed reviews but took the gamble. I have finished playing it ... well, almost, as have an "alternate ending" to enjoy to finish off. 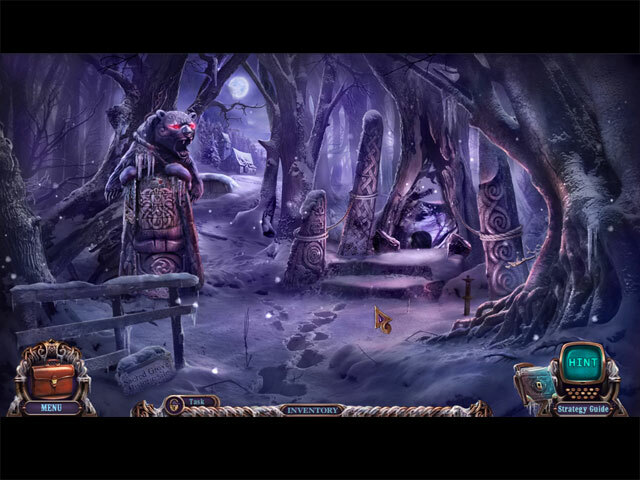 Dire Grove quite simply is the backdrop to Dire Grove, Sacred Grove and what a good storyline it is and an "old friend" pops up at the end ... I could certainly "feel" how cold it was too ... reaching for something warmer to put on and it is a hot Summer over here. I thoroughly enjoyed this game because .... : of the beautiful detailed artwork; the wonderful music; the intriguing storline and colourful characters; top notch atmosphere and one of my favourites is the mini games that took me at least half an hour to complete ... only did 2 or 3 completely on my own ... great fun. Just to finish my opinion of this game ... it definitely deserves a higher rating and I can't understand the negative reviews ... will anticipate the next MCF game!